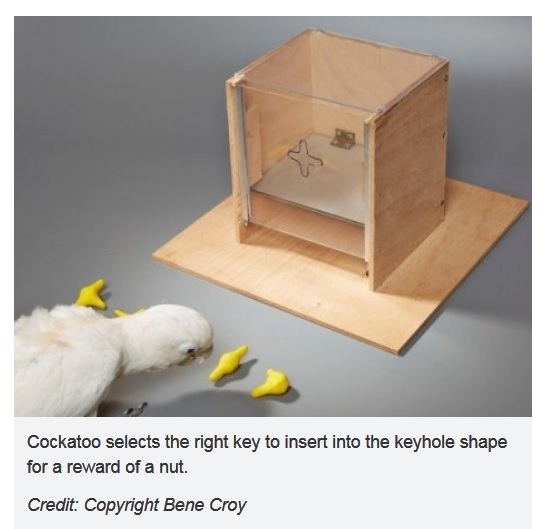 Cockatoos Trained to Use Correct Key in Keyhole – FIREPAW, Inc. Animal cognition research continues to teach humans about the cognitive capacity of our fellow animals we share the planet with. In this latest study, parrots were trained by cognitive biologists to use the correct key in keyholes. The Goffin’s cockatoo is not a specialized tool user in the wild but has shown the capacity to invent and use different types of tools in captivity. Now cognitive biologists have tested these parrots in a tool use task, requiring the birds to move objects in relation to a surface. The animals had to choose the correct “key” to insert into a “keyhole” in a box, aligning its shape to the shape of a surface cutout inside the box during insertion. The parrots were not only able to select the correct key but also required fewer placement attempts to align simple shapes than primates in a similar study.